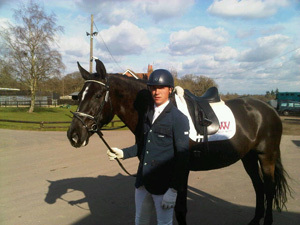 Andrew Gould and Priory Dressage are thrilled to announce Derby House as a new sponsor for 2012. 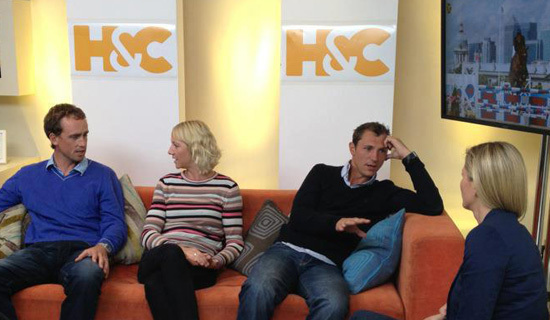 Andrew is a huge fan of the Derby House products and can’t wait to pick some of their amazing designs for his competition horses. 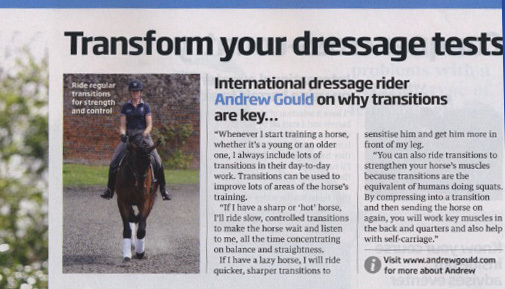 2012 has kicked off with tremendous results for Andrew and his horses, the additional sponsorship from Derby House will allow him to continue to focus on riding and keep up those impressive high scores! 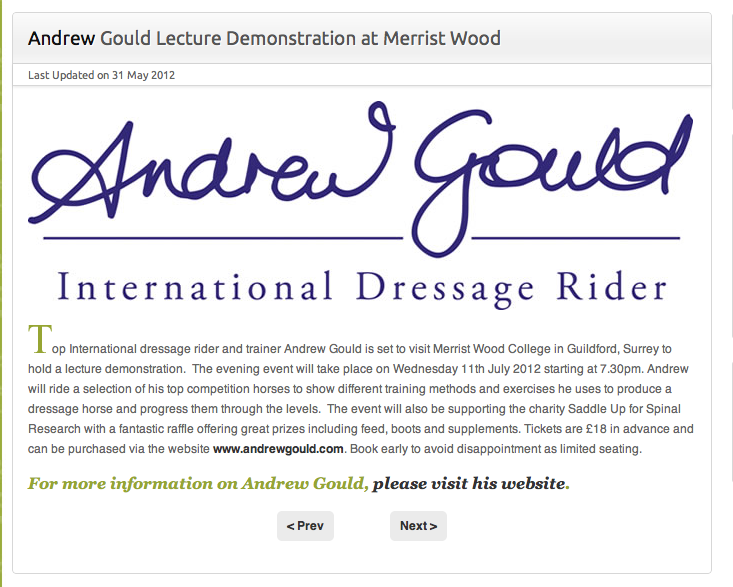 Andrew is delighted to announce the exciting arrival of three new dressage prospects for the coming season. 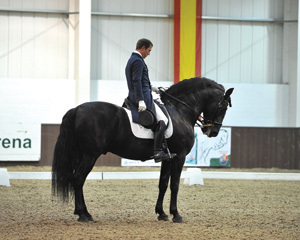 DW Bellisimo, an eleven year-old BWP black gelding, who has competed lightly at Grand Prix level in Holland. Waranda, the nine year-old KWPN chestnut mare bought by Andrew and Polly at the end of last year at auction. 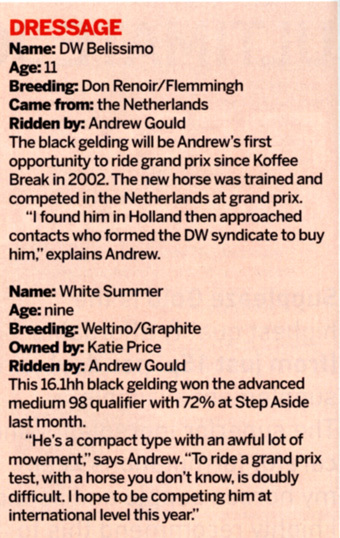 And White Summer, a nine year-old KWPN black mare owned by Katie Price. 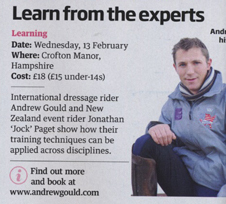 Andrew’s level of talent has been highly praised by British Dressage and as a result he has been selected to be fast tracked to become an ‘Elite’ trainer, recognised by the UKCC Level 3 Trainer qualification. 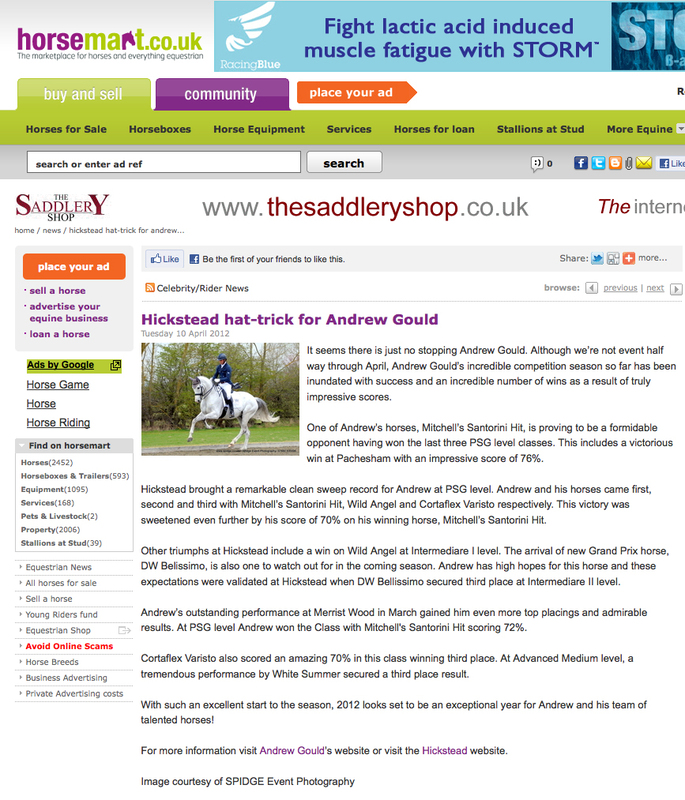 Andrew scored a Personal Best at Prix St George on Saturday 10th March at Pachesham. 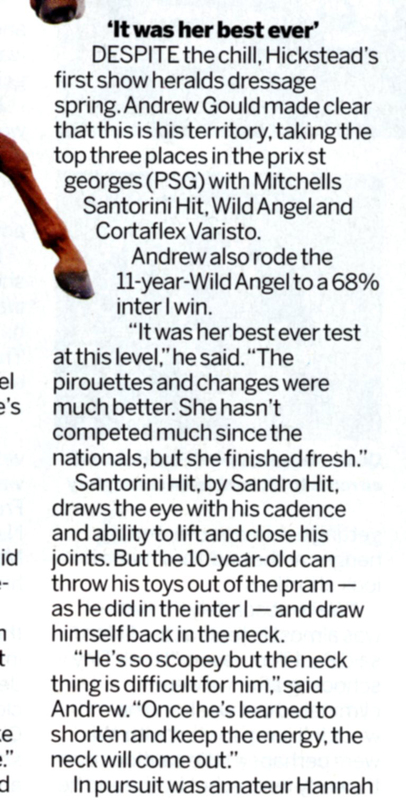 Mitchell's Santorini Hit won with 76.18% and Cortaflex Varisto was second with 72.5%. White Summer also won the Advanced, so overall, a very good day! 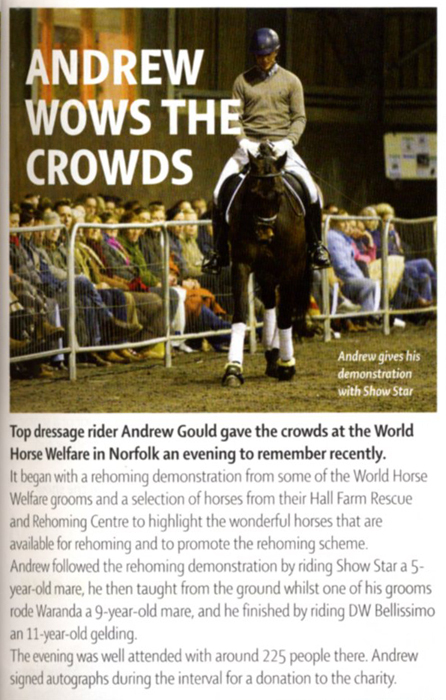 Andrew had a fantastic day at Wellington on Monday 5th March. White Summer won another class, taking the Advanced Medium with over 71%! 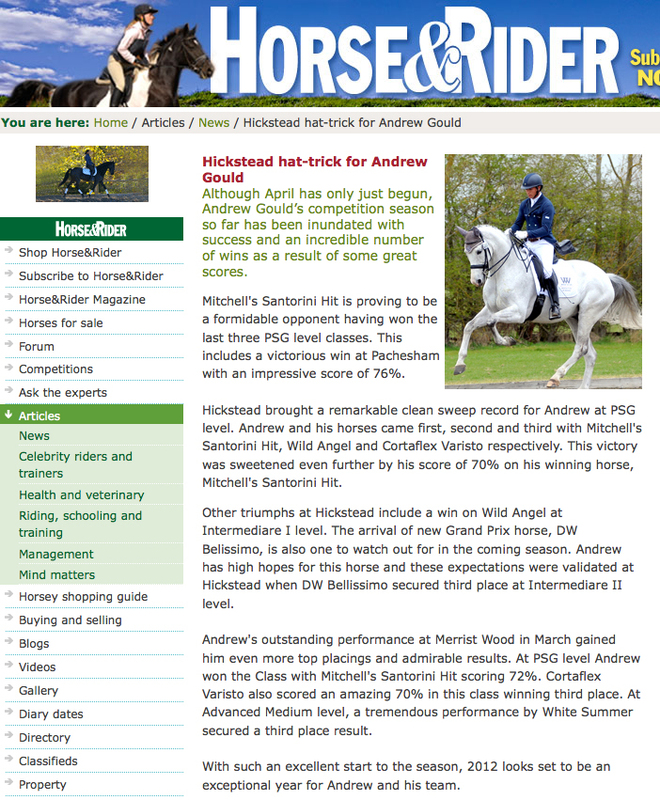 Mitchell's Santorini Hit scored over 67% in the Prix St George - which is not bad after just having nine months out of the ring! Habanero XLI won the Intermediaire I section in the PYO and finished in fifth place overall in the class.